Using manual ISO obviously gives you more control, but auto ISO may mean that you get "the shot" under quickly changing conditions (such as street photography, varying quickly between direct sunlight, shade, indoor lighting. Is auto ISO a convenient feature or a bad habit? Hardware ISO control exists to amplify the signal before readout to maximise the signal to noise ratio. Without read noise you wouldn't need ISO if you had a high precision ADC as you could simply shoot everything at the native sensitivity, and if the image was too dark just apply digital gain (multiply the pixel values). The ISO 100 image is noisier, on account of read noise being amplified when the exposure is fixed. The ISO 1600 is amplified before readout so read noise is much lower. As such ISO is not a creative control (like shutter speed and aperture) it is a practicality, required by the need to overcome noise. Contrary to popular opinion using a lower ISO wont give you less noise. Unless you also decrease shutter speed or open the aperture, both of which can result in a different looking image. I don't consider it "lazy" to use auto-ISO, as the camera is not altering the creative controls, it's just trying to minimise read noise for you. - You're still at the mercy of the camera's light meter, you can get overexposure if the meter gets confused (which wouldn't happen if you fix the ISO to a low value). - Some cameras don't offer exposure compensation with auto-ISO meaning if the metering is consistently off due to scene content you might not be using the optimal noise reducing ISO. Using auto ISO in either program, shutter priority or aperture priority is slightly different as there are two or three values for the camera to choose, and the ISO value is no longer simply dependent on the light reading. + You'll be able to use preferable shutter speeds aperture more of the time than if ISO sensitivity was fixed. - You're at the mercy of the auto-ISO algorithm, you're still letting the camera make creative decisions. I found a very definite advantage of auto-ISO in a situation I was in last week. I was on a mountain in Wales doing some low-fly shooting which is where pilots train in low-level flying by navigating the mountains, and scream down the valleys. Initially I was using Tv mode with 1/1000th and ISO 400, and letting the camera choose the aperture. But I found in actuality, that if I put the camera in M mode, fixed 1/1000th, or 1/1250th, and fixed f/8, and auto-ISO, then I was getting a good fast shutter speed, good depth of field at f/8, and the camera was auto-choosing the ISO and selecting anywhere between ISO 320 and ISO 1600 depending on cloud cover, background, etc, for exposure settings. It may not have been the 'correct' way to do it, but I found it an interesting technique anyway.. When I'm in a setting where I have controlled lights, camera on a tripod and the subject posed, I shoot with complete manual control because I'm not rushed, everything is planned. When I'm in the wilderness, be it urban/city or true nature, then I often use the TAv mode on my camera which, for those not familiar with Pentax, is effectively manual mode with auto ISO. Based on my anticipated subjects, I'll set the shutter speed and aperture (tweeking as things change) and just let the camera pick the ISO. I don't want to be fumbling for the right settings as a scene unfolds! The difference I described, however, is the basis of where some will define "bad habit" and others will not. Studio photographers, measuring everything, may see anything but manual to be lazy and giving up control. Street photographers, or photojournalists, don't have the luxury, they're given mere moments in time to capture the shot and will see features like auto ISO has helping to make that happen. Google the term "f/8 and be there" to see the history of that idea. Either way, the ISO isn't about controlling motion or depth of field, the artistic elements of the shot. So, really, who cares? Worry about your composition, your subject, and don't sweat the technical details. I used to be afraid of high ISOs but it is of course a cause-effect mindtrick: we are used to seeing noisy high ISO images from reviews and flashless lowlight scenes. But we forget that there's differnt types of noise in the process and not all of them gets amplified in the analogue gain (controlled by the ISO setting) - however, it all will get mulitplied in the contrast manipulation in postprocessing. I was inspired by Matt Grum's point that increasing light through the lens and adding light to the scene changes (improves) signal to noise ratio, not the ISO to make a test. I let the raw converter find the best black point and white point individually for each image, which results in an equal resulting exposure. 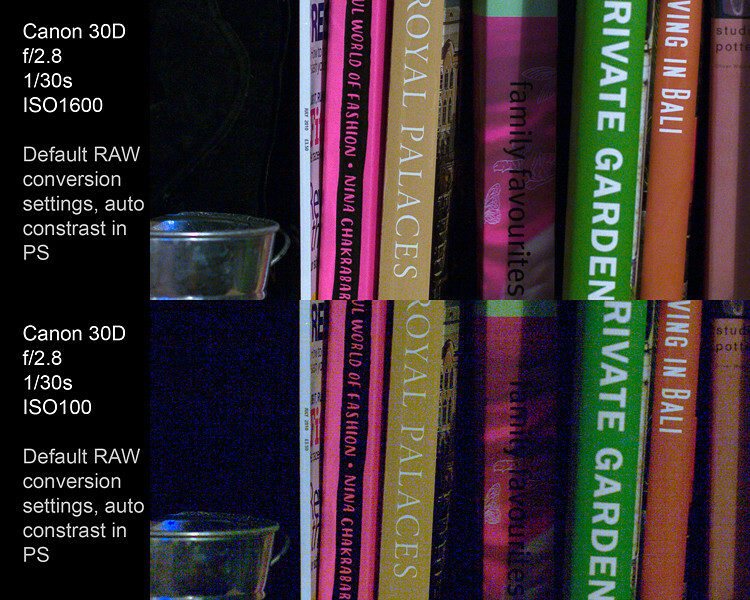 This is without flash, F/4.5, Shutter 1/15, ISO 200,400,800,1600 (left to right). Indeed, we see more noise in the ISO 200 especially. Here we see Less noise than above overall because the photon density improved, even through the same amount of light gets integrated on the sensor (since I changed the shutter time and aperture to compensate), and there is still more noise in the low ISO settings. Now the noise is gone from all the ISOs. I couldn't go to ISO1600 here because it would oversaturate the whites. It confirms that ISO doesn't increase noise, but it can even decrease it, because you make the fixed readout noise less significant. So you should only worry about the aperture and shutter time and let the camera set the ISO (or do it yourself) accordingly to ensure you always make use of the full digital dynamic range, and don't worry about the number it turns out to be. If you have optimized the amount of light on the scene, through the lens and integration time as much as you can, you are good to go. Auto ISO is a convenient feature AND a bad habit :-). For studio and fixed use or when you have time to think it is of very little value. For walk around situations with mere mortal cameras, upper ISO setting is liable to be noise constrained in a given setting and lower ISO setting is liable to be blur or subject motion constrained. Chances are that setting a wide ISO range will hurt you more than help. So, as long as your camera allows rapid ISO changing and as long as doing it is etched into your brain so it can be done without thought, auto-ISO does not really offer you a vast amount and can reduce rather than improve your end results. I have a Sony A77 with max and min of the range settable on Auto ISO. For gneral purpose use I use Aperture priority mode, but may use anything else that suits if required. If I use auto-ISo at all I usually set it over a rather tight range - say 400-800, MAYBE 400-1600. The most major problem is probably that the camera does not know what your intentions are, and ISO setting can affect not only noise levels but also eg motion performance. I recently took a photo from a moving car with the camera set to auto ISO 400-1600. It was a spur of the moment shoot-it-or-lose it occasion with no time to alter settings. The camera decided it was a nice bright day so 400 ISO would be just fine. I lost 2 stops of shutter speed on a shot where blur rather than noise was important and the result suffered. If I had been on foot outside then it would have been a fine choice. But by the same token, if 400 ISO was OK for wandering around I may have used it and if a dark doorway or similar demanded it I could have made the choice between extra care and bracing or ISO changing. A question set worth asking is, under what conditions would a really wide range of ISO settings be acceptable?, and if they would not be, what advantage do I gain from a say 1 or 2 stop range? If you are using a flash, or taking a group or semi formal photo (wedding, 21st, family group photo) then you would usually have a reasonable exact idea of what you want to achieve. Not only ISO but aperture, white balance setting , any dynamic contrast adjustment options and effects or filters or, ... . With perhaps shutter speed being the free variable which allows the others to be preset. If you do all that and then shutter speed is too low you go back and change something. Auto ISO is unlikely to help in such a case. ie if 50 ISO is preferred then you are unlikely to be happy with 100. If 800 is acceptable would 200 cause unexpected problems with subject motion or camera shake or ... . I do a fair amount of what loosely fits into the "street photography" category - mainly for fun but with some paid jobs (also for fun of course :-) ). . Party, sports casual, children at play, street scenes, walking through a fair or festival, literally people in the street (Ladies Market in Mongkok, HK is hard to beat for variety and interest, but it may also be my local mall ), ... . With the A77, up to 1600 ISO gives an acceptably good result for me in most such situations for spontaneous spur of the moment shots. I almost invariably use aperture priority. A child running needs larger aperture to boost shutter speed, plus good care in focusing accordingly. People walking or stationary allow f8+ in most cases. If a group of people pose or take time to let me interact I'll usually drop ISO to 400 or so allowing smaller aperture, and deeper depth of focus. A dark alley way may tempt me to ISO 3200 - but I'm more likely to try bracing against a doorway and Ninja breathing. THE POINT of all the preceding, is that in few of those case would auto ISO be my friend. The running child does not want the camera to choose 400 ISO. The group shot may as well have the acceptable 400 ISO quality or lower. If i decide to use flash I may drop to ISO 200 or 100 deep-ending. If I drop off the 18-250mm walkabout lens that I usually fit and fit the 50mm f1.8 or 500 mm f8 mirror that I carry almost everywhere then I also have a very very good idea of the ISO that will match the reason that made me change lenses. SO for me auto-ISO is of some use, but when I am "out and about" it is liable to get in the way of what I want to do, because what I want to do is very variable. If you have a camera with superb low ISO performance (say approaching D700 capability on up) then you may be able to afford a wide ISO range, But with more mortal cameras you tend to be hemmed in at one end by noise and at the other end by potential blue. Auto-ISO is still useful, but I can easily live without it. One last factor is ease of ISO change with the camera being used. With the A77 the ISO button is just rear of the shutter button - slide index finger back and press. Then either roll the front adjuster which is under your right middle finger or (milliseconds slower but what I actually do) flip index finger onto front adjuster and jump ISO up in multiples of 2, then finger back again to shutter OR roll rear control which is under your left thumb to step ISO in EV/3 or EV/2 steps. Very fast. If your camera takes many seconds to set the ISO setting the options may change. I'm on a D7000 and I tend to shoot in aperture mode with auto-ISO on. My reasons are that I shoot unplanned wildlife (no control of subject) and I do so with a 500 mm tele zoom that does not let in a lot of light. So, in A mode, shooting by hand, the only way I can get a guaranteed minimal shutter speed of say 1/500s is to raise the ISO and I let the camera decide how high. I do consider it a bad habit because at times I get images that are sharp yet too noisy. I'm now bettering myself by slowly decreasing the maximum ISO one can set in the auto ISO settings. Capping it to a maximum makes it painfully visible where you have serious lighting problems, because it will result in longer shutter times. Sometimes I simply have to conclude that the shot is not possible given the scene and my equipment. If you know how to quickly meter and light an unfolding scene, then you can shoot using a set, low iso, just like in the good old days of film, which were about 16 years ago. If you came of age with digital and auto settings, then you will probably always rely on automatic tricks like constantly changing auto iso. I like more control than that in all situations, because I am still a smarter shooter than my D750. Even at a major event, I'm the guy with a monopod or tripod shooting slow shutters and popping rear curtain flash for proper ghosting. Or I'm leaning on something. Not the answer you're looking for? Browse other questions tagged dslr exposure iso auto-iso or ask your own question. What are general rules for ISO settings? Can I use auto flash and auto ISO in Aperture priority mode on a Nikon DSLR? What does fast/normal/slow mean for Pentax auto-iso?